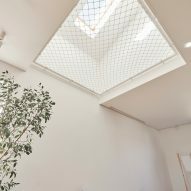 Russian architecture studio Ruetemple has renovated a family home in Moscow, creating an open living space using suspended nets for children to play in and bedrooms that overhang the central communal area. 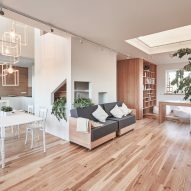 The architects focused on maintaining visibility and openness within the 160-square-metre home, allowing for natural light to fill the residence, while the parents can keep an eye on the children as they play above. 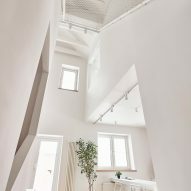 The studio began its renovation when the building consisted of just an external frame with no internal walls. 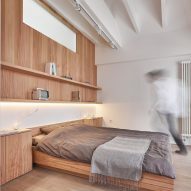 In dismantling the beams between the floors, Ruetemple were able to completely change the layout of the rooms in the residence. 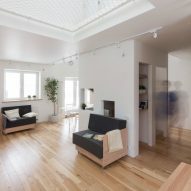 The netted areas are suspended over the communal living area, where the family spends most of their time together. 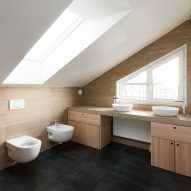 The architects maximised this space, opening it up from floor to ceiling, meaning that the rooms on the second floor are smaller in size. The upstairs bedrooms and workspaces are overhanging structures with windows overlooking the downstairs kitchen, study and living area. 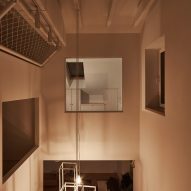 The house is designed around a central staircase, which is boxed in by a white structure with geometric holes that let light into the stairwell. At night, the stairwell softly illuminates the open space with light that streams through the cut-out shapes of the internal windows. 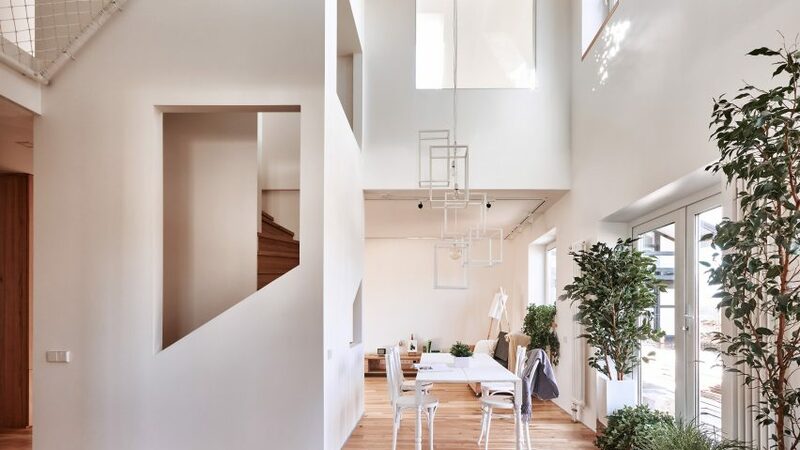 The irregular layout of the house is subdued by an all-white and wood interior. Most of the beech or pine furniture is integrated into the interior structure, making the most of the house's limited floor space. 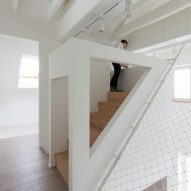 Netted areas are increasingly being used by architects to maximise any spare room in buildings, creating suspended play areas that children can use for work, rest or play. 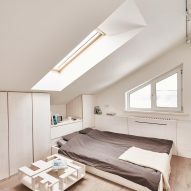 Ruetemple has used the space-saving feature in previous projects, including designing a play area above the master bedroom of this Russian summer house to keep the children occupied before their parents wake up.